Klick Technology took the design brief and adapted their furniture to create a bespoke solution in keeping with the atmosphere of the building. The school’s aim was to create outstanding science facilities of the highest quality with enduring products. At the initial tender stage furniture suppliers were asked to submit samples for assessment. Klick’s sample cupboard was robust, well constructed and met our specification. They were subsequently appointed and were able to accommodate the attention to detail required to fulfil the architect’s brief. The project was completed to the exacting standards required resulting in a flexible and modern environment of exceptional quality. 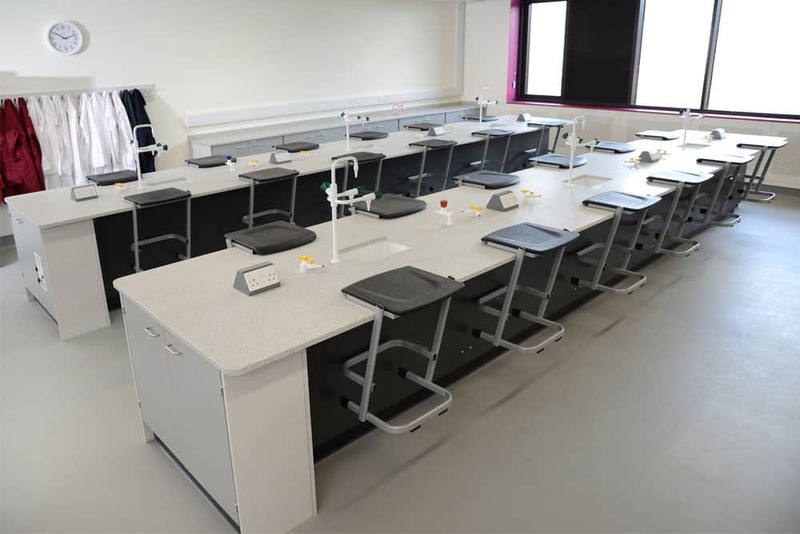 Klick provided the fixed furniture for Phase 1 of the new Science and Mathematics Centre at Charterhouse School, Godalming, Surrey. They were very helpful during the tender stage, providing good quality representative samples to assist the design team in the process. During the Construction stage, they worked closely with the design team and client, delivering a product which has proven to be excellent value for money. We have been particularly impressed with their after sales care, responding diligently and quickly to any concerns and issues raised. During the design phase of the project Klick provided a package which included drawings, material and cupboard samples to demonstrate our ability to meet the brief. The furniture needed to compliment the impressive historic buildings and offer a high quality and long lasting solution. Klick developed a bespoke furniture design for the new Science and Mathematics Centre. The architect was looking for clean lines and detailing to tie in with the aesthetic of the prestigious new building. Large islands were adopted for the practical area which create impact and promote collaborative learning. Velstone worktops have seamless joints which add to the streamlined look and offer great value for money. The Klick site team worked closely with the main contractor to maintain the required attention to detail and adherence to programme.